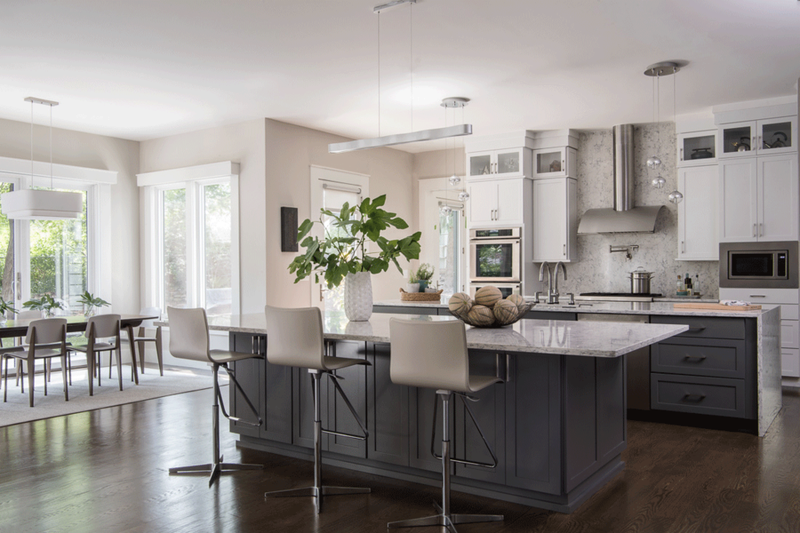 Recently, a design-savvy young family asked Arlington Home Interiors to help make their 9,000 square foot new build both sophisticated and intimate. They wanted a modern feel with quality selections, furnishings and floor coverings that would stand up to a busy family and lots of entertaining. They didn’t want to sacrifice style for a kid-friendly house. Our design needed to be modern but not cold. Calm but intriguing. Sophisticated and cozy. Here are some of the design strategies we used to deliver our solution. The family room had a large, long, open floor plan. To break the space down and make it more intimate, we divided it into two “conversation areas.” The first area featured facing 10-foot custom sofas, covered with a durable, textured fabric and anchored in the center with a large, leather ottoman for resting your feet. The second seating area featured two over-sized swivel chairs and a modern glass cocktail table. The chairs allow for TV viewing (with maximum room for family-time snuggling) or can be turned to face the adjacent kitchen area. A custom-cut, Moroccan-patterned wool rug connected the spaces. The plans for the enormous kitchen included two islands; one to use as a homework area and for entertaining and a second with back-to-back sinks for food preparation. To define the spaces, we selected complementary lighting fixtures and chose quartzite countertops for a natural marble look - without the marble maintenance - and to visually connect the surfaces. One of my favorite art pieces is the custom chandelier in the dining room, which features 20 hand-blown glass globes in a variety of neutral hues. Talk about a ‘Wow’ factor! To help the fixture pop, we chose a dark blue-gray accent wall for high contrast and kept the other furniture neutral and spare. We continued with our neutrals with texture theme in the master suite to create a sense of calm and sophistication. In the master bedroom, I love the glam details of the over-sized, tufted headboard and the Lucite legs on the ottoman. The tray ceiling with uplighting, another custom glass chandelier, and modern fireplace wall adds to the "luxury suite get-away" feeling of the room. 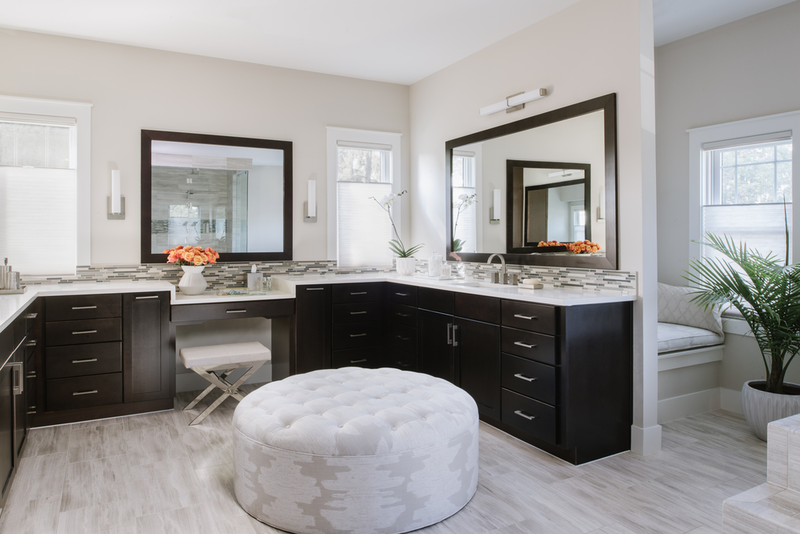 The master bathroom features a spa-sized steam shower, step up soaking tub, and counter space galore. A large ottoman fitted in beautiful indoor-outdoor fabric is perfect for damp locations and further warms up the space. 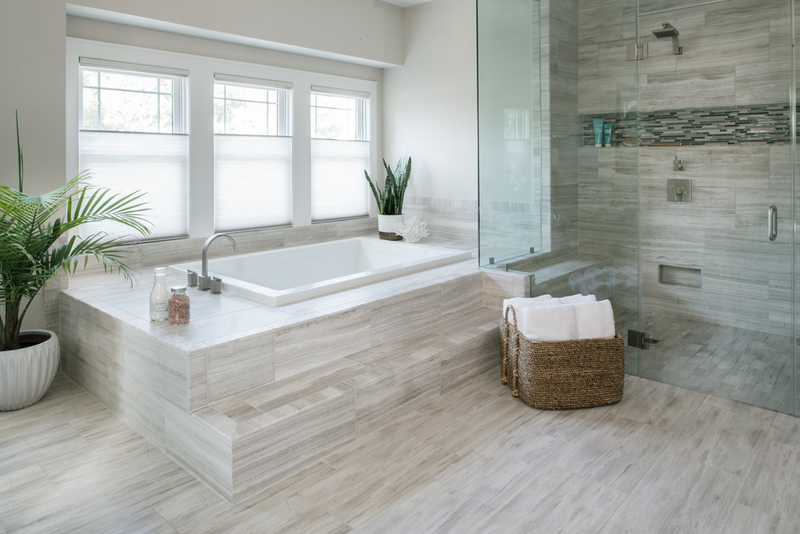 The stone throughout is a cross-cut taupe marble, with stone and glass accents in neutrals and water colored linear tile. In the end, we achieved our goal. The furnishings were sleek and modern. The fabrics were textured and tactile. The spaces were interconnected and intimate. Who says big spaces can’t be cozy? P.S. Want to see more? This project was featured in a beautiful seven-page spread in Home & Design magazine!